The study analysed data from the International Cardiac Arrest Registry (INTCAR), with the aim to examine variation in functional outcome and in-hospital management with regard to center, for patients suffering out-of-hospital cardiac arrest (CA). 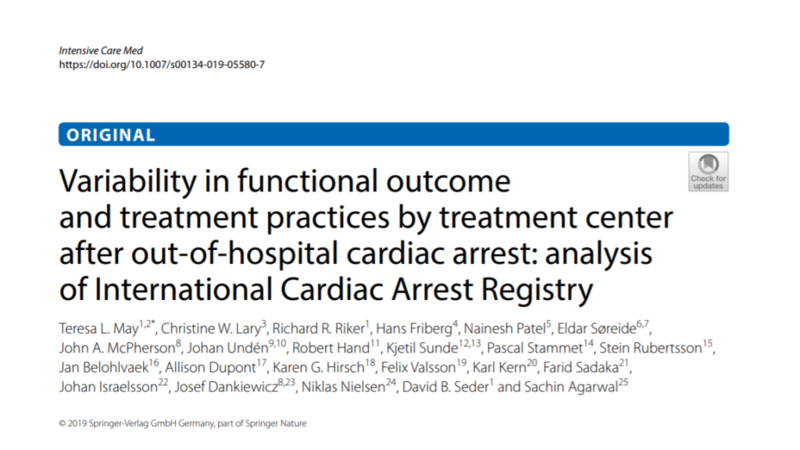 The INTCAR is an international (centers from Europe and the US) database including patients admitted to an intensive care unit after suffering CA. In the present study a total of 3855 patients were included. There were major variability (from 11% to 63%) in good outcome between centers, also after adjusting for patient-related factors. High performing centers were characterized by 1) having shorter time to goal temperature when initiating target temperature management (TTM), 2) more often using 33°C as goal temperature for TTM, 3) being more likely to perform percutaneous coronary intervention in unconscious patients and 4) using a variation of methods for prognostication, when compared to low performing centers. The authors conclude that center-specific differences in functional outcome exist. These differences are partially explained by differences in treatment.